What is so different about Australia? Glow worms (larvae of a tiny gnat, living in caves and overhanging rocks - not the same as the 'glow worm' of the northern hemisphere, which is the larva of the firefly) live only in Australia and New Zealand. And how did it become so different? 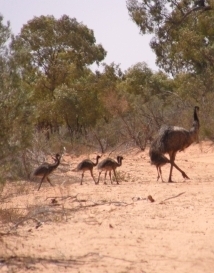 Australia has been the most isolated of all continents since splitting from the great supercontinent Gondwana about 50 million years ago, and the evolution has had a chance to produce many different ways of coping with the Australian environments. 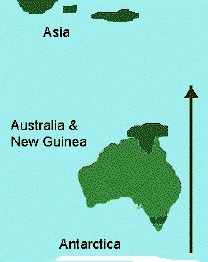 About 50 million years ago Australia and New Guinea jointly drifted away from Antarctica,. 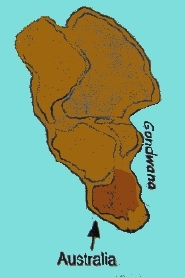 This was the final major break-up of the huge southern continent. 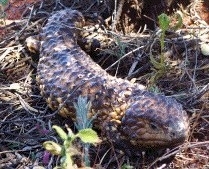 Australia broke away before any hoofed animals, cats, bears, monkeys, rodents or other placental mammals reached it, but did have monotremes (egg-laying mammals) and marsupials (mammals whose young are born at a very immature stage and attach firmly to a teat inside a pouch or between protective flaps of skin for the next few weeks). As it drifted northwards, Australia was isolated from other continents for many millions of years. Bats and sea mammals soon reached it - others had to wait until it got close to Asia. 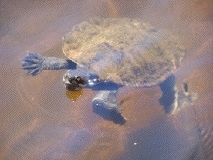 Thus its fauna and flora include many species whose ancestors were in Gondwana, some of which, like the emus, freshwater turtles, tree frogs and land snails, still somewhat resemble their cousins in South America, which had also remained attached to Antarctica for a long time (in the days when Antarctica still had forests). 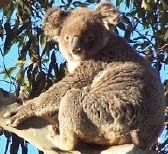 Others, like the kangaroos, platypus and lyrebirds, are remarkably different from animals on any other continent. Fish are vertebrates that live their entire lives in water, breathe through gills and don’t go through the kind of dramatic life-change that amphibians do (although some, like the lungfish, have developed ways of occasionally breathing in air). Australia’s freshwater fish have all evolved relatively recently from marine ancestors – we don’t have the families common in other continents with a long evolutionary history of freshwater life. The Australian lungfish, a freshwater species capable of breathing in air, is considered a ‘living fossil’ and is found in some of Queensland’s rivers. Only five other species occur worldwide, all in Africa and South American waters. It is strictly protected. The eels (photo top right) in Australian rivers start their lives near New Caledonia and other part of the south-west Pacific, make a journey to Australia where they live for 12 years or more in the rivers of the east coast, then find their way back to their birthplace to breed. There are usually at least a couple resident on the Araucaria property. The world’s largest fish, the whale-shark, visits the western coast each year. Carefully-controlled diving near these huge creatures (which feed only on plankton) is a popular tourist activity at Ningaloo. The strange leafy sea-dragon, related to sea-horses, can sometimes be seen by divers near Kangaroo Island and other parts of the southern coastline. 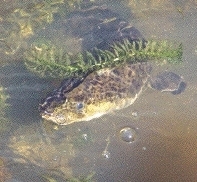 The mud skipper, seen amongst mangrove roots (and climbing them!) north of Cairns, comes out of the water and stares at you! Invertebrates deserve many pages of web space, ranging from microscopic mites of the leaf litter and plankton in the sea, through the amazing reef-building corals and 'cold-light' producing glow worms, bright and beautiful butterflies, to giant earthworms and giant clams - thousands upon thousands of species, and many we probably do not yet know the existence of. Australian spiders include the 'true' spiders and the 'primitive' spiders. 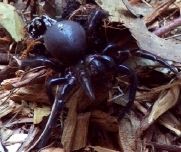 The 'primitive spiders have jaws which point downwards, meaning that to bite they need to rear up and strike downwards. Australia's most dangerous spiders, the funnel webs, are in this group, and also the trapdoors. To keep the danger in perspective though, there have only been 14 recorded deaths by funnel webs in the history of white settlement. Most of these have occurred in Sydney, where funnels are sometimes built in gardens and inadvertently disturbed. 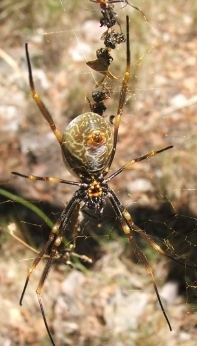 The 'true' spiders include all the others, including the infamous redback (probably a form of black widow, responsible for a similar number of deaths but none since the introduction of antivenin in the 1950's), the large and impressive golden orb weavers, the huntsman and wolf spiders that chase their prey instead of snaring it, and many others, some quite beautifully coloured. The vast majority are never dangerous, but some can give a painful nip. What do the words 'vertebrate' and 'invertebrate' mean? Vertebrates (like the turtle on the right, and the koala above) are animals with a chord of nerve tissue running from the brain down the centre of their backs protected by a series of small bones (or cartilage in some of the more 'primitive' fish such as sharks and rays) known as vertebrae. This column of bones is often called a 'vertebral column', a 'backbone', or a 'spine'. All vertebrates also have skull and ribs, and apart from fish most have four limbs (either four legs, two wings and two legs, or two arms and two legs). 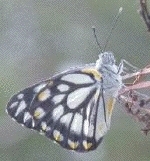 Invertebrates (like the butterfly pictured) do not have vertebrae, and their nervous systems often follow a somewhat different pattern. 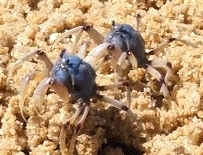 The largest group of invertebrates are the arthropods, including insects, spiders, crustaceans and others with an external skeleton (exoskeleton), a tough skin which supports and holds the softer body parts in place in much the same way that the internal skeleton of vertebrates does for theirs. Other invertebrates are molluscs (which often have hard eternal shells but not jointed limbs), various 'worms' (which include several distinctly different and unrelated groups), anemones, sea-stars and various other groups.